In fact, in England and Wales it is 'R.E Month'! The aim of this week is to showcase R.E by highlighting the value and importance of religions education for every child and young person. Mrs Westaway-Green organised for every Year Group to visit a place of worship in the local community. We have all been very busy! 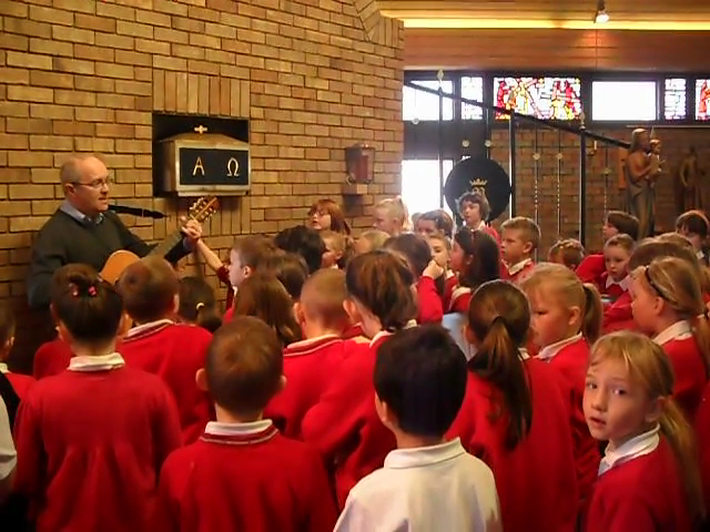 On Monday afternoon, the children had a service led by Phil Lord. Tuesday afternoon saw our very own Chair Governor, Cannon John Glover come in to lead a service for the whole school. Reception visited the United Reform Church to witness a christening. There are some lovely photos! On Wednesday, there was hardly anyone left in school! Year 3 went off on a very enjoyable walk along the prom to St Mary's Catholic Church on Wellington Road. Here, they met Father Ramsay, who showed them all around the church. They had the opportunity to ask questions, sing songs, hear jokes, visit the vestry and the confessional, sample the communion bread and spot differences between an Anglican and Catholic church. Thank you Father Ramsay, all the children had a fantastic time! Years 1 and 2 went off to The Baptist Chapel in Sussex Street. There, they met Rev. Trevor Casey and had a look around the Chapel and learnt more about baptism. Thursday saw Years 5 and 6 visiting the Mosque in Rhyl, on Water Street. This building is also known as the Islamic cultural centre. Al the children have had a lovely week. Thank you Mrs Westaway-Green for organising it all. Look at all the photos below!